Let me introduce myself to ye. who. I be th' ships first mate 'n bosun as we have no Cap'n. Cap'n steer us to new adventures. Ahoy me buckos 'n enemies this be Mutiny Magazine ! This e-magazine comes in a time when we need a tool that can bring those wayward pirate souls together to inform, entertain, and communicate. 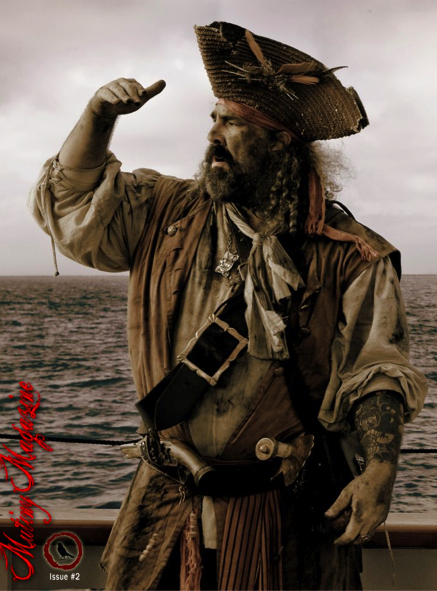 We on th' Mutiny Crew want to welcome ye to our vision of a pirates magazine. "Tis be not all things to all people but what us band 'o pirates think it should be! This is an E-magazine for adult pirates (18 and older) covering a range of subjects we think are interesting: rums, weapons, ships, music, history, event 'n Top pro swimming mermaid centerfolds. Lust ys or hate us th' price be right (FREE) 'n we're doin' what we like. Send us a message in a bottle wit' an idea. Perhaps ye gunna make the' grade 'n our gathering of pirates or shall I say be pressed into service. Deep below in me black heart I sincerely hope ye heartly enjoy 'tis adventure. As our adventure begins let us introduce th' crew to ye as we castoff, lettin' ye turn th' pages. Thar be many 'o us 'n many more jumpin ships to come on board. Sharpen yar cutlasses, ready yar readin' monocle 'n join th' mutiny.